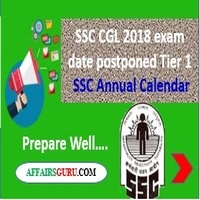 Staff Selection Commission (SSC) has confirmed that SSC CGL-18 is postponed through the official SSC Annual Calendar. SSC CGL-2018 Tier-1 is most likely to be conducted in OCTOBER. Reason of postponed for SSC Exam are given below. Since SIFY’s contract is not extended after 30th June. There is currently no vendor available to conduct exam. Hope that it will be conducted by vendor NAIS. 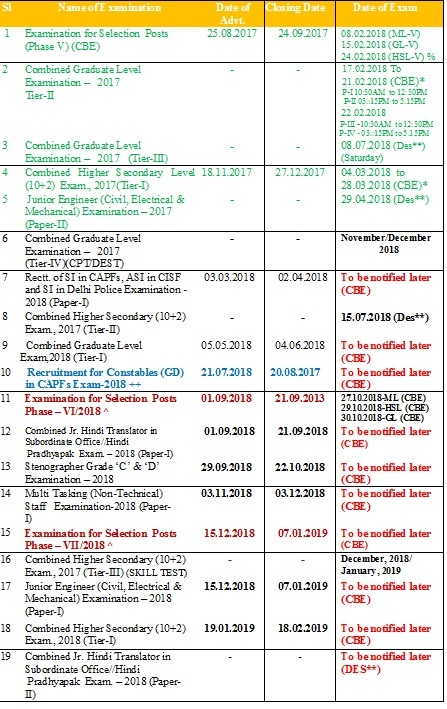 According to some logic and expectations, SSC will conduct CPO-2018 at first as its expected dates were one month before CGL-18. You can expect 2-3 months delay due to vendor change and some other issues like scam & court hearing for Tier-2 Exam. Competition level is on the shocking raise. You need to go against the grains this time as more number of aspirants. You must start study right now as time slips off sooner than expected. This time, level may go even higher than before. You may also see a little unpleasant change in the level of question sets as SSC will now be showing great attention regarding its exams. Just prepare best for the post. Read newspaper daily as it enhance general awareness sections knowledge. Read Editorials from Hindu News Paper. Solve the reasoning & Quantitative aptitude questions on daily basis. Prepare well for English through different books. Give online tests through online medium. Check the SSC Annual Calendar contains the details of the exams going to be planned by SSC official. Candidates can check the SSC Annual Calendar officially by clicking on below link. Aspirants can read the SSC CGL Tier-1 syllabus by clicking on below link.